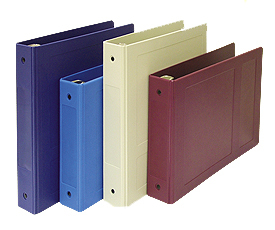 Open Top heavy-duty 1 1/2" molded chart ring binder. Designed with a twin hinge system to prevent tearing due to excessive opening and closing. Ten (10) colors: mauve, beige, dark blue, light blue, hunter green burgundy, gray, black, teal, and seafoam green. Franklin Mills can custom imprint any ringbinder with your facility name and logo for added professionalism. Imprints are available in a variety of colors and are hot foil stamped into the ringbook surface so the image will not wear off.